He began his practice in Kettering in 1857. As well as his normal duties, he took on the role of public vaccinator, which involved the difficult task of persuading often reluctant parents to allow their children to receive the new-fangled prevention against smallpox. He became medical officer of the workhouse, and the rural sanitary authority, and was therefore responsible for the prevention of infectious diseases. He was the inspiration behind the building of the Isolation Hospital (later Rockingham Road Hospital) in1897. He was a keen huntsman and cricketer. 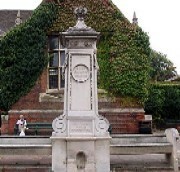 After his death, the Dryland Memorial-a drinking fountain for people and animals - was erected in Sheep Street. This page was added by Chris Leuchars on 14/02/2008. Whereabouts on Rockingham Road was the Isolation Hospital? I believe it was where 'Rockingham Paddocks' is today. Not surprisingly right on the edge of town, (as was). I have sighted a map dated 1885, this shows an Isolation Hospital in Gipsy Lane almost opposite the road now known as Bowhill. I assume this was the original site that John Winter Dryland chose for his hospital.